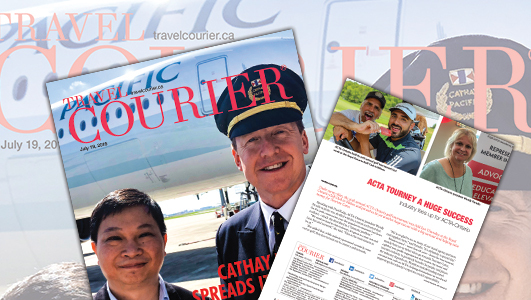 With last month’s delivery of its first Airbus A350-1000 aircraft in Toulouse, France, Cathay Pacific is spreading its wings and set to launch a series of new long-haul destinations, reports assistant editor, Greg Coates in this week’s digital edition of Travel Courier. The Airbus A350-1000, the first of 20 that will join the Cathay fleet by 2021, along with the A350-900 – of which the airline has 22 in service – will serve as the backbone of Cathay’s long-haul services. After initial rounds of regional services, Cathay’s new Airbus-1000 will be deployed on a Hong Kong-Washington DC route. Service to Washington will launch Sept. 15 and at 8,153 miles makes it the longest on the airline’s network. The 1000 is the latest and largest member of the A350 XWB wide body family and features advanced and simplified systems, light-weight structures with 70% of advanced materials of which 54% is Carbon Fibre Reinforced Polymer and incorporates unique morphing wing technology. Eric Schulz of Airbus described the 1000 as the “world’s newest, most sophisticated aircraft,” renowned for its fuel efficiency and passenger comfort. Cathay Pacific is only the second airline to take delivery of the 1000 (Qatar Airways being the first). Cathay’s version carries 334 passengers across Business, Premium Economy and Economy class cabins, 54 more that the airline’s A350-900s. Passenger comfort is at the heart of the design. Features include a new Economy class seat with larger, high definition personal television, an advanced inflight entertainment system and LED mood lighting. The cabins are also 50% quieter than other aircraft. Enhanced Wi-Fi connectivity means passengers can remain connected throughout their journey.